Separation from the 'Am ha-Areẓ. Term ordinarily used in rabbinical lore in its original Biblical sense, "companion," "friend" (Ps. cxix. 63; Ab. ii. 9, 10). A Talmudic proverb says, "Thy ḥaber has a ḥaber, and thy ḥaber's ḥaber has a ḥaber; thy words will thus circulate and become public" (B. B. 38b; 'Ar. 16a). The Rabbis urgently recommend study in company, asserting that only in this way can knowledge be acquired (Ber. 63b; Ned. 81a); therefore, if necessary, one should even expend money for the purpose of acquiring a companion (Ab. R. N. viii. 3). A prominent teacher of the second century declared that, while he had learned much from his masters, he had learned more from his "ḥaberim" (Ta'an. 7a). Hence the term came to mean a "companion in study," a "colleague"; and when preceded or followed by the term "talmid" (pupil) it denotes one who is at once the pupil and colleague of a certain teacher, a scholar who from being a pupil has risen to be a colleague or fellow (comp. B. B. 158b; Yer. Sheḳ. iii. 47b). Eventually "ḥaber" assumed the general meaning of "scholar" (B. B. 75a), and appears as a title subordinate to Ḥakam (comp. Ḳid. 33b). The title "ḥaber" was known in comparatively early times (11th cent. 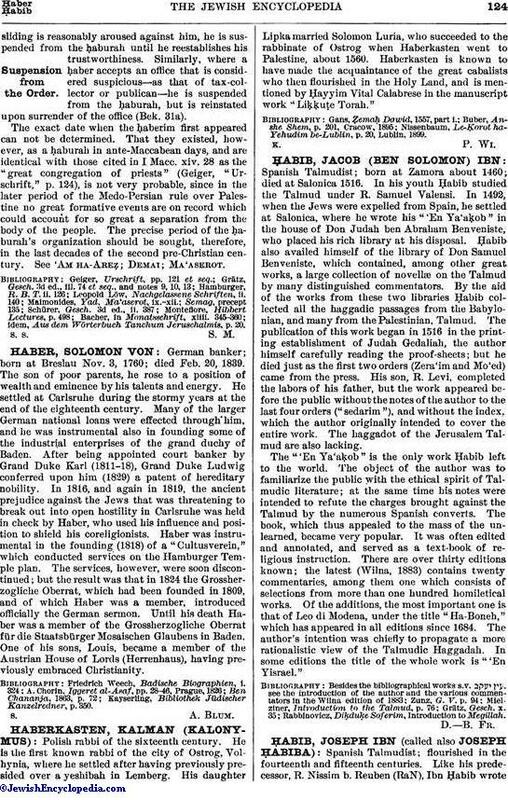 ), when it probably referred to a member of a court of justice (see Schechter, "Saadyana," p. 81, note 2); but in Germany in later centuries it indicated that its possessor had devoted many years to the study of sacred literature. In congregational life it was conferred as a rule on married men, but often also on yeshibah graduates who were single. It is worthy of note that Jonathan Eybeschütz conferred it on the Christian professor Tychsen. "Ḥaber" also denotes a member of a society or order ("ḥaburah," "ḥaburta," "keneset" = "aggregation," "company," "union"), or of a union of Pharisees for the purpose of carrying out the observance of the laws of "clean" and "unclean" to their fullest possible development. In their eyes, any person about whom there was a doubt as to whether he was particular in the observance of these laws or those concerning the tithes was an 'Am ha-AreẒ, whose contact was defiling. 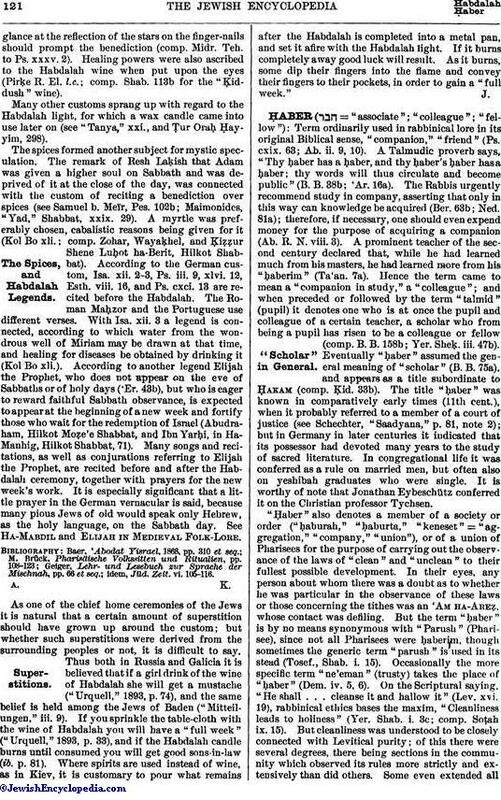 But the term "ḥaber" is by no means synonymous with "Parush" (Pharisee), since not all Pharisees were ḥaberim, though sometimes the generic term "parush" is used in its stead (Tosef., Shab. i. 15). Occasionally the more specific term "ne'eman" (trusty) takes the place of "ḥaber" (Dem. iv. 5, 6). On the Scriptural saying, "He shall . . . cleanse it and hallow it" (Lev. xvi. 19), rabbinical ethics bases the maxim, "Cleanliness leads to holiness" (Yer. Shab. i. 3c; comp. Soṭah ix.15). But cleanliness was understood to be closely connected with Levitical purity; of this there were several degrees, there being sections in the community which observed its rules more strictly and extensively than did others. Some even extended allthe precautions necessary for the priest in eating holy things to the layman who lived on secular food (Hag. ii. 6, 7; See Pharisees). Diploma Conferring the ḥaber Degree, Issued by Marcus Benedict, 1828. The Bible (Lev. xxvii. 30-32; Num. xviii. 21-28; Deut. xiv. 22-29) lays on the products of an Israelite's farm and on his herds certain imposts to be paid respectively to the priest, the Levite, and the poor (comp. Tobit i. 6-8), but which were not universally paid. The rules governing these imposts, as well as the rules of "clean" and "unclean," were doubtless familiar to the people at large; but not all people found it convenient or possible to comply with them. Particularly difficult must their observance have been in the unsettled state of affairs during the Maccabean wars. It is suggested by some that it was at this time that the so-called "'am ha-areẓ" (who included the great majority of the people), either driven by circumstances or seduced by temptation, neglected them; and that a certain more rigorous minority, notknowing whom to trust in such matters, formed among themselves associations ("ḥaburot"), the members ("ḥaberim") of which pledged themselves to keep faithfully the rules of Levitical purity and those regarding the tithes. Accordingly the ḥaber is one who strictly observes the laws of "ma'aserot" (tithes) and of Levitical cleanness (see Giṭ. v. 9). To be admitted as a ḥaber the candidate must declare his determination never to present the "terumah" or the "ma'aser" to a priest or a Levite who is classed as an 'am ha-areẓ; nor to allow his ordinary food to be prepared by an 'am ha-areẓ; nor to eat his ordinary food ("ḥullin," grain and fruit from which terumah and ma'aser have been separated) except in a certain state of Levitical cleanness (Tosef., Dem. ii. 2). This declaration must be made before three members of the order, and if they are satisfied that the candidate has lived up to the rules in his private life, he is accepted at once; otherwise he is admitted as a "ben ha-keneset" (son of the union, neophyte; comp. Bek. v. 5; Zab. iii. 2) for thirty days. According to Bet Shammai, this period suffices only when membership is sought for the lesser degrees of purity, while for the higher degrees the period of probation must be extended to a year. After this period, if the candidate has proved his constancy, he becomes a ḥaber or ne'eman. And in this respect no distinction is made between the learned and the ignorant; all must make this declaration. An exception is made only in favor of a scholar attached to a college, it being presumed that he took the pledge when he first joined the college (Bek. 30b). As there are several degrees of Levitical cleanness, so there are several classes of ḥaberim and ne'emanim, pledging themselves to corresponding observances. The lowest class is that which pledges itself to practise Levitical cleanness of "kenafayim" (lit. "wings"). This is a very obscure term, for which no satisfactory explanation has been found. It is generally assumed to mean "hands"; and inasmuch as the Pharisaic maxim is, "Hands are always busy," touching without intention on the part of their owner both clean and unclean things, they are regarded as being in a state of uncertain cleanness; hence one must cleanse them before eating anything Levitically clean (Ṭoh. vii. 8; comp. Mark vii. 3 et seq.). This may be legally accomplished by pouring on them one-fourth of a log of water. But that process suffices only where a person wishes to eat ḥullin, ma'aser, or terumah. If he desires to eat the sacrificial portions, he must dip his hands into forty seahs of water; and if about to handle the water of lustration, he must first subject his whole body to immersion (Ḥag. ii. 5; Gem. 18b et seq.). 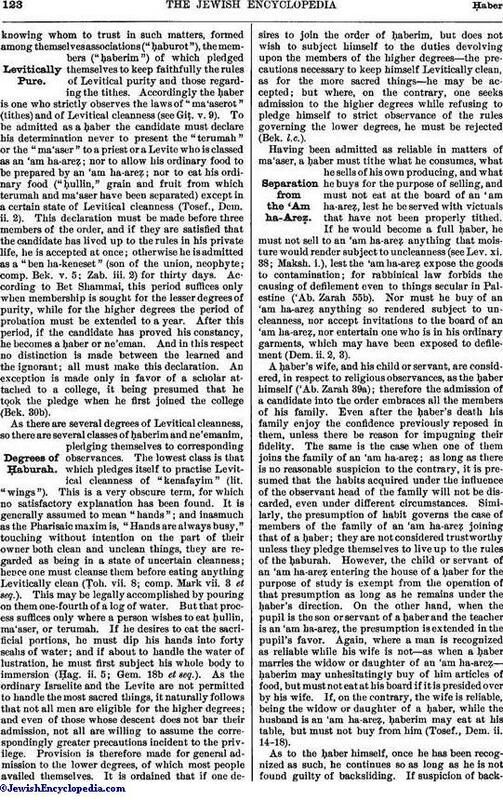 As the ordinary Israelite and the Levite are not permitted to handle the most sacred things, it naturally follows that not all men are eligible for the higher degrees; and even of those whose descent does not bar their admission, not all are willing to assume the correspondingly greater precautions incident to the privilege. Provision is therefore made for general admission to the lower degrees, of which most people availed themselves. 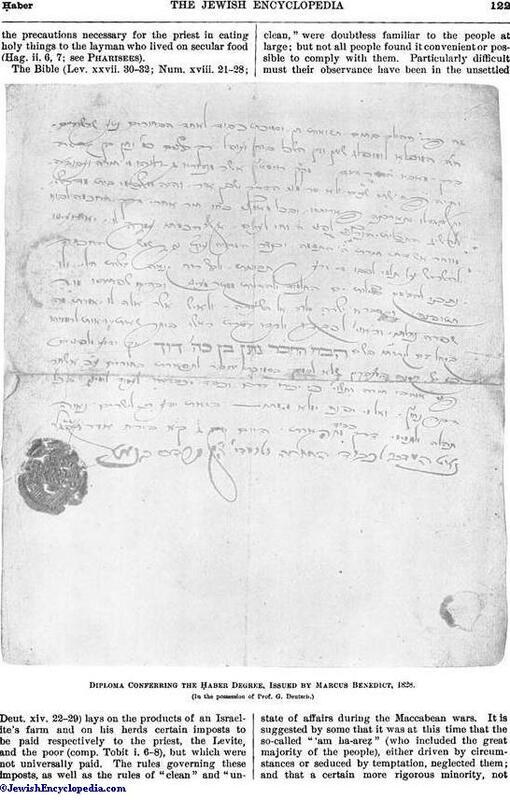 It is ordained that if one desires to join the order of ḥaberim, but does not wish to subject himself to the duties devolving upon the members of the higher degrees—the precautions necessary to keep himself Levitically clean, as for the more sacred things—he may be accepted; but where, on the contrary, one seeks admission to the higher degrees while refusing to pledge himself to strict observance of the rules governing the lower degrees, he must be rejected (Bek. l.c.). Having been admitted as reliable in matters of ma'aser, a ḥaber must tithe what he consumes, what he sells of his own producing, and what he buys for the purpose of selling, and must not eat at the board of an 'am ha-areẓ., lest he be served with victuals that have not been properly tithed. If he would become a full ḥaber, he must not sell to an 'am ha-areẓ anything that moisture would render subject to uncleanness (see Lev. xi. 38; Maksh. i. ), lest the 'am ha-areẓ expose the goods to contamination; for rabbinical law forbids the causing of defilement even to things secular in Palestine ('Ab. Zarah 55b). Nor must he buy of an 'am ha-areẓ anything so rendered subject to uncleanness, nor accept invitations to the board of an 'am ha-areẓ, nor entertain one who is in his ordinary garments, which may have been exposed to defilement (Dem. ii. 2, 3). A ḥaber's wife, and his child or servant, are considered, in respect to religious observances, as the ḥaber himself ('Ab. Zarah 39a); therefore the admission of a candidate into the order embraces all the members of his family. Even after the ḥaber's death his family enjoy the confidence previously reposed in them, unless there be reason for impugning their fidelity. The same is the case when one of them joins the family of an 'am ha-areẓ; as long as there is no reasonable suspicion to the contrary, it is presumed that the habits acquired under the influence of the observant head of the family will not be discarded, even under different circumstances. Similarly, the presumption of habit governs the case of members of the family of an 'am ha-areẓ joining that of a ḥaber; they are not considered trustworthy unless they pledge themselves to live up to the rules of the ḥaburah. However, the child or servant of an 'am ha-areẓ entering the house of a ḥaber for the purpose of study is exempt from the operation of that presumption as long as he remains under the ḥaber's direction. On the other hand, when the pupil is the son or servant of a ḥaber and the teacher is an 'am ha-areẓ, the presumption is extended in the pupil's favor. Again, where a man is recognized as reliable while his wife is not—as when a ḥaber marries the widow or daughter of an 'am ha-areẓ—ḥaberim may unhesitatingly buy of him articles of food, but must not eat at his board if it is presided over by his wife. If, on the contrary, the wife is reliable, being the widow or daughter of a ḥaber, while the husband is an 'am ha-areẓ, ḥaberim may eat at his table, but must not buy from him (Tosef., Dem. ii. 14-18). As to the ḥaber himself, once he has been recognized as such, he continues so as long as he is not found guilty of backsliding. If suspicion of backslidingis reasonably aroused against him, he is suspended from the ḥaburah until he reestablishes his trustworthiness. Similarly, where a ḥaber accepts an office that is considered suspicious—as that of tax-collector or publican—he is suspended from the ḥaburah, but is reinstated upon surrender of the office (Bek. 31a). 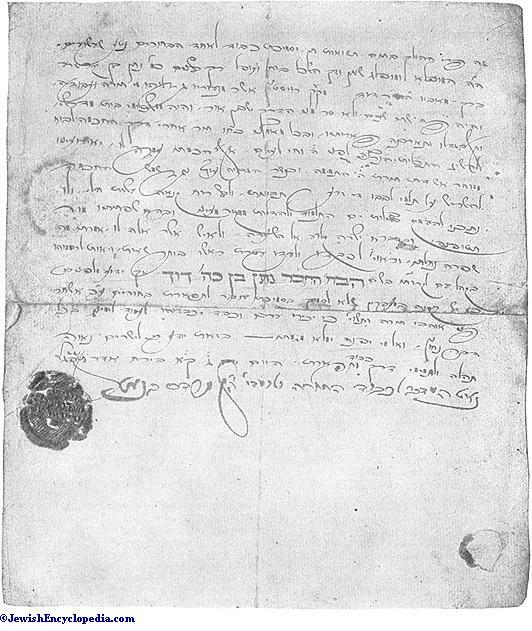 The exact date when the ḥaberim first appeared can not be determined. That they existed, however, as a ḥaburah in ante-Maccabean days, and are identical with those cited in I Macc. xiv. 28 as the "great congregation of priests" (Geiger, "Urschrift," p. 124), is not very probable, since in the later period of the Medo-Persian rule over Palestine no great formative events are on record which could account for so great a separation from the body of the people. The precise period of the ḥaburah's organization should be sought, therefore, in the last decades of the second pre-Christian century. See 'Am Ha-AreẒ; Demai; Ma'aserot. idem, Aus dem Wörterbuch Tanchum Jeruschalmis, p. 20.